Before solving the puzzle around deduction under section 80TTA, we first need to understand what this section is all about. Savings account is one of the most convenient and the most popularly used accounts in our country. In order to encourage the small savings, the Government of India, started granting tax benefits to the account holders of savings account. According to section 80TTA of Income Tax Act, a deduction of Rs 10,000 can be claimed on interest income. Income Tax Act permits certain accounts and deposits on which there is no tax deduction, regardless of the limit of the amount of such interest. That is the reason why there is no Tax Deducted at source (TDS) on the savings account. However banks deduct tax, with respect to the FDs, if the total interest income is more than Rs.10000. Such deduction is available for an Individual and Hindu Undivided Family in a savings account held with banks, cooperative banks and post offices. The above mentioned deduction comes with a restriction i.e. the deducted amount claimed should be Rs 10,000 or actual interest whichever is lower. This benefit is not available to a firm, an Association of Persons, a Body of Individuals, LLP or Company Assessee. This kind of deduction is not available for interest which is earned on Fixed Deposits or time deposits or term deposits. It is also furnished that the income referred to in this section is derived from the deposits in a savings account held by, or on behalf of, a firm, an association of persons or a body of individuals, no deduction shall be allowed under this section in respect of such income in computing the total income of any partner of the firm or any member of the association or any individual of the body. 1. The total amount of interest received on the Savings account is the taxable income. 2. Bank cannot deduct TDS (Tax Deducted at Source), but in case of a Non Residential Ordinary account the bank may charge 30.9% deductions. 3. One cannot claim deduction separately from each of his/her multiple saving account. In such a case a deduction of Rs 10,000 can be made on aggregate income received. 4. These deductions were applicable from 1April 2012 and came into effect from AY2013-14. 5. There is an exemption from TDS on the interest earned on saving account, According to Section 194 A of Income Tax Act. 1. Initially the interest rates were controlled by RBI and it was set 4% per annum. 2. All banks had to agree to this rate regardless of the amount of money kept in the bank. 3. From 25 October 2011, RBI de-regularized this system of fixing interest rates. 4. This gave banks the power to fix the rate on their own which led to the creation of free economy. HOW SHOULD ONE CLAIM THESE DEDUCTIONS? 1. In order to claim the deductions one needs to add his/her respective total income under the head ‘Income from other sources’ while filing returns. 2. These returns are displayed under Section 80 Deductions under section 80 TTA. 3. If person A has a saving account and he earned an interest amounting to Rs 18,000. Out of this amount, the taxable amounts is Rs 8,000. Person A can claim Rs 10,000 as a deduction under section 80TTA. But if the total amount of interest earned from all the savings account is Rs 9,500 then the entire amount can be claimed as a deduction under Section 80TTA. It is necessary to keep in mind that one is eligible for this deduction only in case of interest earned by the individual or HUF is from their savings account, held either in a bank, a co-operative bank carrying the business of banking, or a post office. This deduction is not permitted on interest earned by that individual or HUF, which arises from fixed deposits, recurring deposits and any other form of time deposits. This benefit is not available to a firm, an Association of Persons, a Body of Individuals, LLP or a Company Assessee. This type of deduction can not be claimed on the interest that has been received on FDs/time deposit or term deposit. A deduction of Rs 10,000 is given for interest earned on saving account. No amount is deducted on interest earned. 2. If interest earned exceeds Rs 10,000, the balance amount becomes taxable i.e it is considered as Income from Sources and it is taxed as per the respective slab rate. 3. The deduction is in addition to the deduction of Rs 1, 50,000 under section 80C of IT Act 1961.
woah i like yur web site. It genuinely helped me with the information i wus seeking for. Appcriciate it. This blog conatins details in breifly and accurate manner about Section 80TTA.None of the tax or investment blogs or websites provide such details.It’s really great that u take initiative to tell people about this and your way of representation of thought is really good.We can understand out problem very easily and get our answers faster. Thanks, this really help me alot. This blog is really helpfull for us to know more about ITR too.I can now easily share and understand my knowledge regarding 80TTA ,its salient features,SAVINGS ACCOUNTS AND INTEREST RATES and eligibility for claims. is there any changes being made under section 80TTA after the introduction of GST? 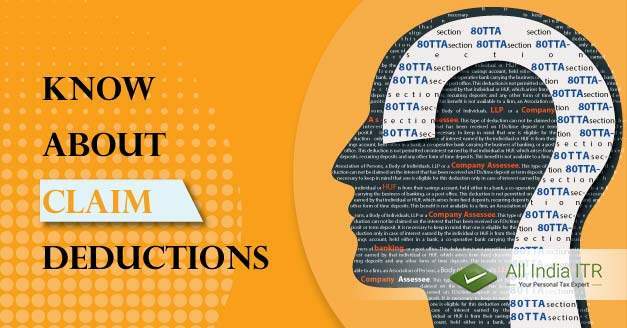 very informative article that helps me to understand to know more bout claim deductions under section 80TTA, and its profits that we are able to take it, Now I knowe all about this that how we are eligible to claim and what are the maximun deduction under setion 80TTA, he deduction is in addition to the deduction of Rs 1, 50,000 under section 80C of IT Act , This benefit is not available to a firm, an Association of Persons, a Body of Individuals, LLP or a Company Assessee, thanks ALL INDIA ITR.